Did you know coffee was first found by goats? Legend has it that, around 850 A.D goat herders in Ethiopia noticed their goats behaving strangely. They were eating red berries from a small shrub and acting hysterical. Wondering if there was some special power to the fruit, the herders decided to cook the berries in boiling water and present them to the king to eat. The taste was so horrible, the king spit them out and tossed them into a burning fire. As the berries burned, the king loved the aroma and told his people to make the drink a second time. They crushed the roasted berries, added hot water and called it a delicious cup of coffee. Colombians may not have discovered coffee but they did help perfect it. The country is now the biggest producer of Arabica coffee beans in the world and locals are crafting everything from pour-over to press and espresso based coffee. 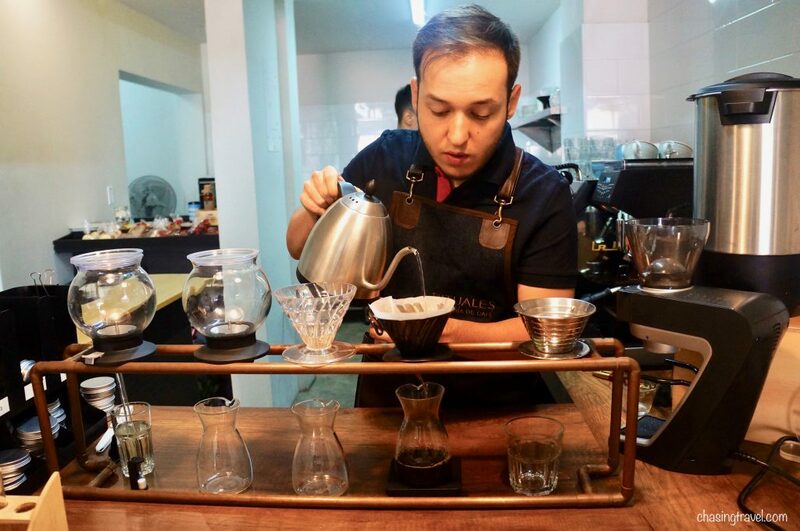 During our month-long house sitting assignment in Colombia, we figured, there is no better place to experiment with coffee than on a half-day coffee-hopping tour in Medellin. Carlos, our guide at Impulse Travel, took us to Laureles, a small suburb north of El Poblado. 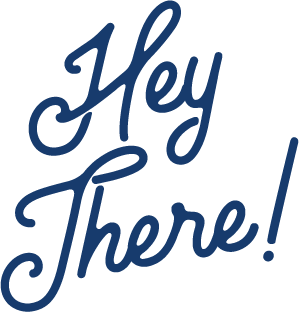 Note: Keep reading for a special discount offer! Laureles is often overlooked for the chic and trendy El Poblado. The popular nightlife and contemporary food scene may be hard to compete with, but Laureles is quaint and laid back, with charming treelined streets, and if you crave a more local experience this is the neighbourhood to be in. 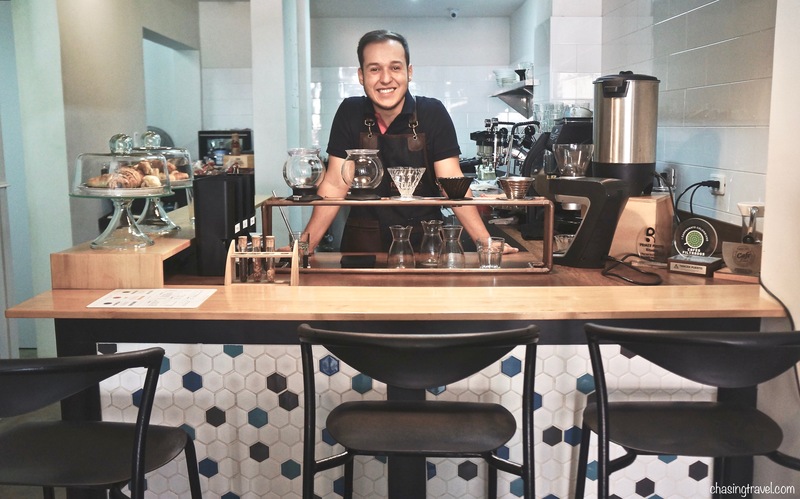 Among mom-and-pop shops and local Paisa restaurants, Laureles is especially flourishing with a coffee-centric community of independent producers that take coffee seriously and where coffee has become an art. 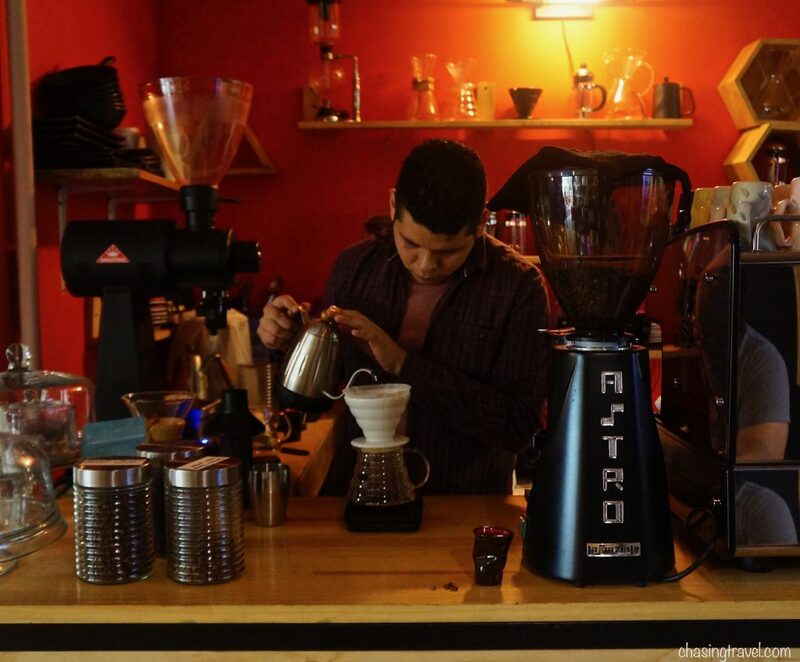 Some of Medellin’s first specialty cafés originated in Laureles. It’s hard not to notice the intense coffee lab in the backroom. Rituales is a cool space where you can pull up a stool by the coffee bar and watch all the magic happen. Their specialty is pour-over, like V60, which happened to be my first taste at specialty filtered coffee. Coffee here is a real labour of love and the amount of manual technique that goes into a brew like V60 is pretty impressive. It is a kind of chemistry project. The right grind size with careful technique, calculation and elements are combined to create the perfect pour-over. The method gets its name from its 60º V-shaped cone. The barista needs to get the heat of the water temperature just right – hot but not overly hot (the sweet spot is between 90º to 96ºC). He carefully tilts his kettle over the grinds, in 2-3 intervals. Speed, motion, and length of time that the water comes into contact with the grinds has an impact on body and taste, so if you do it correctly you can get an excellent filtered coffee in just 2-4 minutes. Pour your water uncontrollably and without attention, and you’ll end up with a flavourless, acidic cup. What to try: V60 if you like your coffee smooth and light-bodied. Try their Paraiso bean. 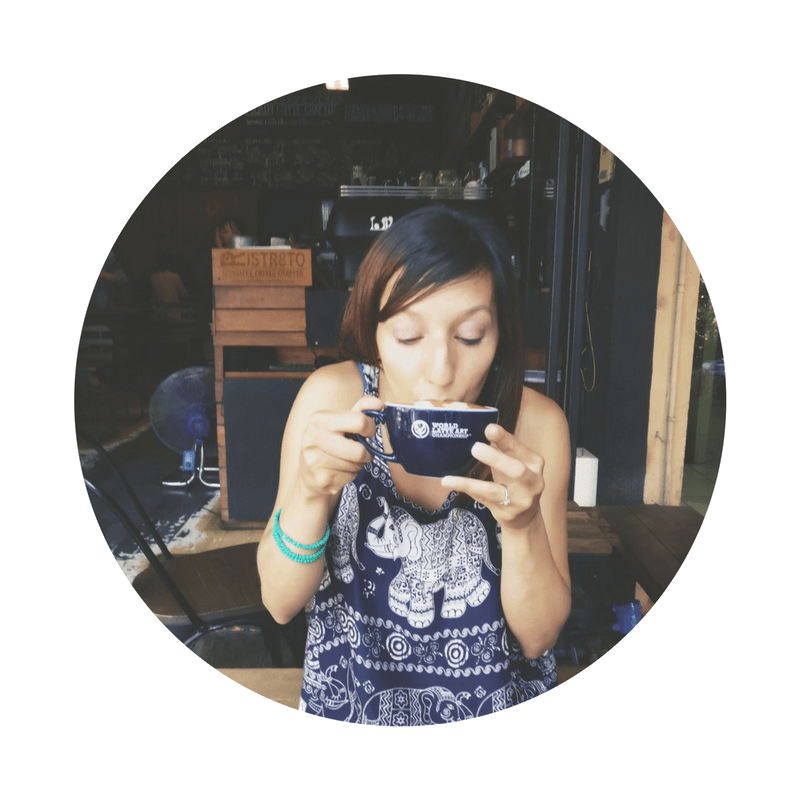 Why you should visit: Every cup you purchase at Rituales helps support local farmers in vulnerable areas. They also placed third in the National Roasting Championship so you know you’re getting a good coffee every time. Encuadrarte is a kind of atelier you come to if you’re an artist, looking for a creative experience. In the world of filter coffee, that would be Chemex – a barista’s most pure brew. It’s a pour-over device with an hour-glass shape that extracts hints of unique flavours. Mauricio says brewing coffee in a Chemex is similar to V60 in that you still need good, hot water temperature and a slow & steady hand for the pour-over. 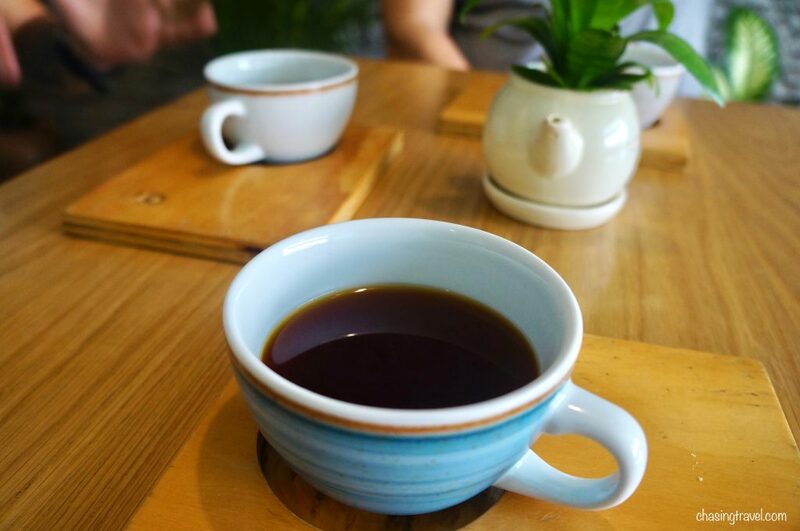 The difference is that the coffee is ground slightly coarser than V60, extraction is longer, and there is more time for the beans’ characteristics to develop. Like most of the staff here, Mauricio is a graphic design student finding art even in coffee. 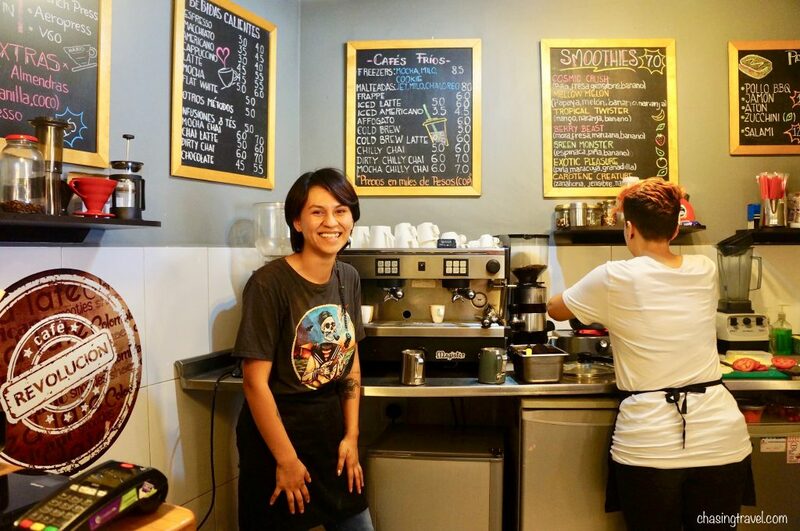 Encuadrarte Café is unique in that it is run by artists and students, and supports other creators within the community. What to try: Geisha in Chemex, V60 or Aeropress. Why you should visit: The café is also a creative studio for graphic design lessons, photography workshops, cooking sessions and other art which you can take part in. They also sell art and hand-crafted items made by local Colombian artists. Or just come for the coffee education. When you discover a café that takes you back in time, somehow you don’t want to leave. The art deco space at Revolución is reminiscent of a 1930s secret society in Old Havana, Cuba. It was one of the first specialty cafés to open in 2014. 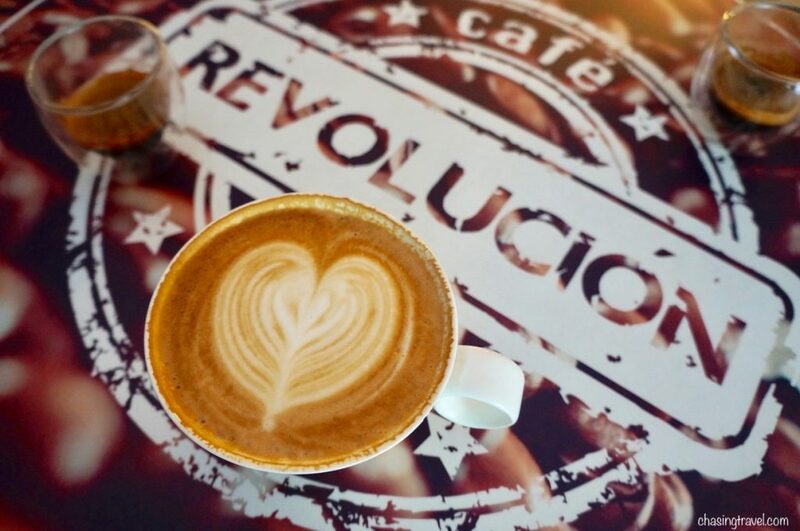 A contrast from the first two places we visited, Revolución specializes in espresso-based drinks from cappuccino to latte and flat white. Most baristas believe it’s better to dark-roast espresso beans but Natalie serves up Colombian-grown espresso roasted at medium-dark so you can get the same richness that you might find in coffee in Italy. I opted for a cappuccino – perfectly extracted. What to try: Any of their espresso-based drinks. Why you should visit: The ambiance. There was one café which we didn’t get a chance to visit on our tour because they were closed for renovations, but at this point we had just had three full-size coffees and my caffeine jitters were kicking in, so it’s safe to say we didn’t mind saving it for another day! The tour is entirely private, so you don’t need to worry about joining strangers or keeping up with a large group. A private transfer is included when you book, which is helpful if you aren’t familiar with navigating the city. They will pick you at your hotel and drop you off. It means you can go at your own pace and there is no rushing to the different locations. The entire experience was very personal. Walking the neighbourhood with Carlos was like walking with a local friend. He was fun and young, knowledgeable and always honest. Meeting and interacting with the baristas one-on-one really made this coffee experience. They took the time to explain the different brewing methods and answer our (many) coffee questions. We were pleasantly surprised, considering the cafés we visited were open to the public and still needed to run a business. It’s an education in coffee. I used to be skeptical of filter coffee. Growing up, filter coffee had a bad rap. I always thought it was cheap, watered down and instant – the chemically-processed powdery kind we find in a tin canister. Am I the only one? I learned on this tour that’s a big misconception and that, in the specialty world, filter coffee can be good quality and tasteful. We tried alternative types of coffee that we wouldn’t know how to order on our own. While highly caffeinated, we also got to explore a new neighbourhood we probably wouldn’t have visited if it weren’t for this tour. Impulse Travel is dedicated to responsible and sustainable travel so we especially liked that all the cafés on this tour support locally sourced coffee & coffee farmers in Colombia. This is important since a lot of the coffee production and producers were negatively impacted by the civil unrest and drug war in Colombia in recent years. If you love coffee, Impulse Travel is giving chasingtravel.com readers a special discount offer! Use this link and get 10% off any of their tours in Colombia. That includes Medellin, Bogota, Cartagena, the Coffee Region and more! Add promo code CHASE10 at check-out. We were guests of Impulse Travel on the coffee-hopping tour in Medellin. All opinions are our own but they are solely responsible for the caffeine jitters we got by the end of the tour. Filter coffee is not my favourite. I feel like there’s always something missing then i tend to add extra sweetener.